Home to over 8 million people, New York is the most populous city in the United States. Having been depicted in numerous films like Breakfast and Tiffany’s and Goodfellas, New York is now often associated with Wall Street’s soaring skyscrapers and monuments, the neon signs of Times Square and the greenery of Central Park, all contributing to the unfading energy of the city. From Broadway shows, to world-class museums like the Museum of Modern Art, to the iconic Statue of Liberty, this exciting city is just brimming with activities to entertain every traveler. Lady Liberty really takes the cake as New York’s most well-known icon. However, getting to the statue is certainly is no easy feat. It involves waiting at least 90 minutes for the ferry to take you from Battery Park in Lower Manhattan to Liberty Island, and then making a stop at Ellis Island on the way back before returning to the mainland. If you have extra time though, a visit here will undoubtedly be worthwhile as it gives you a panoramic view of New York Harbor. But if you’re short on time, you can still have a glimpse of the legendary monument from Battery Park or the High Line. The significance of the Statue of Liberty is that it was the first glimpse of America for millions of immigrants back in the day. So travelers will experience the same overwhelming sense of wonder on the ferry as it approaches Liberty Island. If you have time to spare in the morning or afternoon, head down to this favorite of New Yorkers and tourists alike. Designed by Calvert Vaux and Frederick Law Olmsted, Central Park is home to 843 acres (341 hectares) of not only vibrant flora and greenery, but also hidden histories. It is truly one of the greatest examples of efficient urban planning. You can head here for a leisurely stroll, have a picnic, or even go to the zoo. With such an expansive range of things to do and see, Central Park is an excellent spot to check out all yearlong. The best way to take everything all in is by having a leisurely ride on a bike. Take your time exploring the hilly terrain, stopping to check out the Alice in Wonderland sculpture, Belvedere Castle, or the world-famous Bow Bridge. If you are familiar with the film Enchanted, head down to Bethesda Fountain, where the scene of Princess Giselle explaining her idea of true love to Robert was shot. This statue depicts the Angel of the Waters and four cherubim representing temperance, purity, health, and peace, thus making it a go-to spot for lovers to throw in a coin and make a wish. Check out 5 Free & Fun Things to Do in Central Park, New York City! If you must visit one touristy site, the Empire State Building is it. Proudly standing as one of New York’s tallest structures, the view from the 86th-floor observation deck is so astounding it will sweep you off your feet. Tickets to the observation deck are steep, costing 29 USD a pop. However, it is pretty justified given the view you’ll get to see. Furthermore, there is a multimedia tour, available in eight languages, that guides you through the exhibits and views, as well as additional background information on the building’s history. Tip: if you want to avoid the crowds, the best times to come are early morning at 8:30 a.m. or during lunch and dinner hours, Monday through Wednesday. The century-old Grand Central Terminal, despite being one of the most historical landmarks of New York, is still the busiest train station in the country, having 44 platforms – more than any other railroad station in the world! Even if you don’t have a train to catch from the terminal, it is worth a trip just to spend a few moments watching people zoom past on the shiny marble floors, or marvel at the sky-themed ceiling mural of the huge main concourse. If you are with company, head to the Whispering Gallery for some fun. Stand at the end of Oyster Bar’s ramp and whisper into the wall for your friend on the other side to hear. And while you’re there, remember to have a good look from outside and be blown away at its Beaux-Arts neoclassical architecture. Travelers with a penchant for reading and literature shouldn’t be a stranger to the New York Public Library. If you’re in the city and have the mood to read, you’ll find an exhaustive collection of maps, special collections of English and American Literature, English Romanticism, and rare books. It is no wonder that this main branch (Stephen A. Schwarzman Building) not only attracts book-lovers, but also history junkies and architecture enthusiasts. Even if you don’t like reading, it’s still worth a visit to walk up the grand steps of this building. The two famous noble lion statues, Patience and Fortitude, and the huge Roman-style columns provide a dramatic entrance into the library lobby. Fun fact: not only do books come alive at the New York Public Library, but also on the big and small screens. Over the years, countless movies and television shows have been filmed here. You might have seen the library in blockbusters such as The Day After Tomorrow, Ghostbusters, and Spiderman, as well as in TV shows such as Person of Interest and Gossip Girl. The National September 11 Memorial and Museum were built as tributes to the 2,983 people who were killed in the 2001 terrorist attacks and the six people who were lost in the 1993 World Trade Center bombing. The Memorial’s twin reflecting pools and man-made waterfalls are strategically placed on the spot where the World Trade Center’s Twin Towers once stood before the devastating tragedies. The pools are 1 acre (0.4-hectares) long and are enclosed in bronze panels, on which the names of all victims are inscribed. The overall ambiance here is somber and moving, so young children are advised not to come. The National September 11 Museum retells the events of the attacks through a series of multimedia displays, real-time recordings, and artifacts. General admission to the museum costs 24 USD, but on Tuesdays admission is free for all visitors between 5 and 8 p.m.
Read more about 9/11 at the National September 11 Memorial & Museum. While New Yorkers tend to avoid the congested “Crossroads of the World” like the plague, travelers should not miss coming here to take in the flashing neon lights and brilliant digital displays. So for that reason alone, if you are planning to visit this area, coming after dark is recommended. There are plenty of fun things to do in Times Square, from shopping and to dining, to fun stuff like Ripley’s Believe It or Not and Madame Tussauds Wax Museum. Be sure to take a moment to soak in all the sights. And you will need your camera to capture all the brilliant lights and tremendous crowds. A word of caution, though. Be aware that pickpockets are rampant here, so be sure to protect your belongings at all times. If you are a theater geek, this is where you should be. Having 40 Broadway theaters dotting the Theater District, from 41st Street to 52nd Street and Sixth to Eighth Avenue, means you are definitely spoiled for choice as to which hit musical, play, or revival to attend. While tickets to Hamilton, the hottest show of the season, are almost impossible to get for the foreseeable future, there are countless other shows that are worth your time and money as well. In the mood for a musical? Consider Fun Home, Something Rotten, Waitress, and the up-and-coming The Great Comet. More into plays? Catch Hollywood actors on stage with shows such as An Act of God starring The Big Bang Theory star Jim Parsons and Eclipsed starring the great Lupita Nyong’o. With the never-ending pool of talent from playwrights, actors, musicians, and dancers, you’ll be in safe hands and will no doubt be in for a good time no matter what show you pick. Tip: if you are on a budget, stop by the TKTS booth in Times Square for same-day tickets at a discount. Or if you feel lucky, go to selected theaters before a show and join the lottery (Ham4Ham, anyone?) for a chance to win front row or balcony tickets for a small sum of money. “If you don’t know, now you know!” Check out more tips on Fun Things to Do In New York City! If you are in the city and can’t snag tickets to Hamilton on Broadway, have no fear. Get your dose of the founding father outside of Richard Rodgers Theater by booking yourself a spot on the Hamilton Tour. Join Jimmy Napoli, an Alexander Hamilton expert and enthusiast, as he takes you through the streets of New York City, stopping by the sites where Hamilton once stood (including his favorite bar). Put yourself back in Hamilton’s narrative as you listen to Jimmy tell the stories of the Revolutionary War, the crafting of the Constitution, the origin of the country’s bank, and the infamous duel between Aaron Burr and Alexander Hamilton. Even if you are not a history buff or familiar with the musical, this three-hour tour that runs from Hamilton Heights to Washington Heights will be worth of your time as you’ll get to know so much about the founding of the nation and the face of the ten-dollar bill. The façade of 30 Rockefeller Plaza shouldn’t be a stranger to you, having been shown in countless movies. This iconic plaza not only houses some beautiful sculptures and Art Deco office buildings from the 1930s, but also its centrepiece, the GE Building. Here, you can get a little glimpse of NBC Studios and go up the observation deck for a picture-postcard view of the Big Apple 259 metres above ground level. Combined with a wide range of stores and restaurants, one can easily spend a full day here. If you plan and get tickets months ahead, you can watch the taping of ‘The Today Show’ in the morning, have an overview of the city from the Top of the Rock Observation Deck after, and spend the rest of the evening catching a performance at the exclusive Radio City Music Hall. Travelers visiting the city in the winter are in luck as this place just lights up with a humongous illuminated Christmas tree. Not only that, you can take your ice skates here and glide across the enormous ice rink located right in the middle of it all. New York City, along with Los Angeles, is the main hub for television in America, so why not take a peek at how they make the magic happen? Sign up for the NBC Studio Tour and you’ll get to see the inner workings of some of the country’s most popular television shows. The NBC pages will take you through the halls and into some of the studios that you may recognize, like that of Saturday Night Live, The Tonight Show with Jimmy Fallon, and Late Night with Seth Meyers. You’ll also get to step into the make-up room where stars get readied up before their shows, as well as the high-definition control rooms. This 70-minute tour is one not to be missed, especially if you are a fan of television. Not only will you learn about the TV production process from writing to producing, you’ll get a hands-on chance to create your own show! If you don’t want to spend money on the NBC studio tour, yet still want to experience the magic of television, head to the free tapings of one of the most iconic US shows in history - Saturday Night Live. This is your chance to see the legendary Weekend Updates and brilliant sketches in the flesh. Laugh your night away with the clever lines and slapstick jokes of the current crop of comedians like Kate McKinnon and Kenan Thompson. It’s not easy to get to these tapings though, but you won’t regret taking the chance to have a go at it. Just email your contact information to [email protected] every August, and if you’re lucky, NBC personnels will get in touch with you to let you know if you won. Have an hour to spare and need a break from New York’s hustle and bustle? Just head straight to the High Line, where you will be rewarded with sweeping views of the Hudson River and the Manhattan cityscape. Standing 30 feet (9.1 meters) above ground on an abandoned railway track and stretching for 1.5 miles (2.4 kilometers), this landscaped park covers the city’s vibrant neighborhoods of the Meatpacking District, West Chelsea, and Hell’s Kitchen. It is definitely not your typical walk in the park, having the bright yellow cabs zooming past the street below while you stroll along the boardwalk surrounded by lush lawns, wild flowers, and public art installations. If you don’t want to walk through the whole stretch of the High Line, you can take the staircases and elevators available, and they will bring you down to street level. Having the United Nations Headquarters situated in the city not only makes New York an important hub for international diplomacy, but also makes it the cultural and financial capital of the world. Sign up for the one-hour-long guided tour to get a glimpse of the behind-the-scenes operations of the organization. It is a truly enriching experience, as you not only get to know about the history and structure of the UN, but also learn about how it addresses world issues like peace and security, human rights, and the Millennium Development Goals. If you’re lucky and are there when official meetings are not in session, the multilingual tour guides will even take you inside the newly-renovated chambers! Stepping into the New York Botanical Garden is like living in a painting. This 125 years old botany center is one not to be overlooked. The vast 250-acre garden at the northern end of the Bronx is home to lush gardens and natural forest. If you are in the city, allocate a full day here and you will be rewarded with the sweet-smelling Peggy Rockefeller Rose Garden which houses more than 650 plant species, or the Conservatory, an elegant Victorian-style glasshouse that contains seasonal blooms and special exhibitions like the annual Orchid Show. The Native Plant Garden deserves a mention too. With thousands of indigenous species, this garden gives you a comprehensive look into plants from North America. Get the all-garden pass that costs 20 USD to 25 USD and gives you complete access to all the garden exhibits, the Conservatory, Rock Garden, Native Plant Garden, Everett Children’s Adventure Garden, Tram Tour, and art galleries in the compound. Want a peek at the Statue of Liberty (check out #1 thing to do on this list!) but not willing to spend money on the ferry? Just hop on this free 24-hour ferry service that brings you to Staten Island and back to Manhattan. Even though this 25-minute boat ride is free, it offers some of the best views of New York’s Lower Manhattan skyline. Keep a look out for Governors Island to the east, and Ellis Island and the Statue of Liberty to the west. Don’t be fooled by it’s name. Even if you are not a modern art lover, you can still appreciate spending an afternoon at the world-renowned Museum of Modern Art. Although you can enter the museum for free on Fridays from 4 p.m. to 8 p.m., the 25 USD general entrance ticket for other times is pretty steep, but it is well worth it. MoMA houses some of the world’s best modern and contemporary art pieces, ranging from 20th century history to pop culture pieces. Just to name a few, you’ll get to see iconic pieces like Picasso’s Les Demoiselles d’Avignon, Andy Warhol’s Campbell’s Soup Cans, Van Gogh’s Starry Night, and Salvador Dalí’s The Persistence of Memory. With a constant roll of new exhibitions in the museum ranging from mediums like architecture, photography and sculpture, one afternoon might just not be enough to cover everything, so allocate your time here wisely! Brooklyn Bridge is amongst the famous landmarks of New York. The bridge opened in 1883, making it one of the oldest suspension bridges in the country. Being the first structure to cross the East River and constructed with steel-wire cables that were the invention of the designer John A. Roebling, makes it a feat in architectural innovation. Come here for an arresting view of Lower Manhattan and New York’s landmarks like the Statue of Liberty and Governors Island. It’s a really easy 30-minute walk from Manhattan to Brooklyn (or vice versa), and is a really satisfying way to get to experience both boroughs. Tip: The best times to go are in the early hours so as to avoid the crowds, or in the evening when you can have a majestic view of the sunset over the skyline. Travelers who are tired of the hustle and bustle of city life are in for a treat when they visit New York in the summer. Governors Island is an excellent location for a recreational, or relaxing, day trip. This 172-acre (69.6-hectare) island, formerly a military base, is located in the heart of New York Bay and really hits the spot when all you want is some tranquillity. Visitors can laze around and bask in the summer sun at Picnic Point, which boasts 8 acres (3.2 hectares) of lawns equipped with picnic tables and hammocks. If you want to do more than just lie around like a sloth, bike rentals are available on the island, and are great for cruising this motorized-vehicle-free island. Tip: get a free one-hour rental on weekdays from 10 am to 12 pm. Also do check the island’s event calendar on their website, as there are often funky happenings lined up for the summer, like the annual New York Poetry Festival and the Jazz Age Lawn Party, which will probably make you feel as though you’ve stepped into the set of The Great Gatsby. The only way to get to this green wonderland is via a NY Waterway or East River Ferry boat. Do check out their website for opening dates, as they are only open during the summertime. This year, the public season begins on May 28th. Coney Island is the go-to place if you are looking for a quirky yet thrilling experience. Located in Brooklyn, this resort and amusement area has been named “the People’s Playground” since the 1900s. With such a long history, and the fact that it has maintained many of the decades-long elements, this seaside attraction has a lot of character that keep visitors intrigued. The 2.7-mile-long (4.3-kilometer-long) boardwalk is lined with rows of eateries and entertainment options, including several amusement parks and a museum. For adrenaline junkies, check out the almost 90-year-old Cyclone ride at the newly-opened Luna Park, or the Sling Shot that flings you 150 feet (45.7 meters) into the air at 90 miles (144.8 kilometers) per hour! There are even peculiar events like the Fourth of July hotdog eating contest, and the annual Mermaid Parade. You will never be bored at Coney Island with so many tantalizing things to do, so what are you waiting for? Take an afternoon off and get ready to have a blast here. If you’re looking to find your inner zen, head down to Brooklyn Botanic Garden. It is an incredible place with 52 acres of and extensive collection of over 12,000 varieties of flora and fauna. There are 13 gardens and 5 conservatories, so there are plenty of walking and scenery to soak up here. One of the standouts here is the exquisite Japanese Hill-and-Pond Garden, where you can sit by the lake and just enjoy looking at the wooden bridges and breezy Japanese maples. Plus, if you come here at the end of April, you’ll get to catch the rosy pink cherry blossoms in bloom at the Cherry Esplanade. Another one worth to check out is the Shakespeare Garden, which houses more than 80 plants described in the playwright’s works. Walking along the brick path lined with flower beds, fans of the Bard can experience how it felt to be in an English cottage garden like the Elizabethans. General entrance to the garden costs 10 USD for adults; 5 USD for students and seniors 65 or older. Children under 12 can enter the garden for free. New York is not known to be The Cultural Melting Pot for nothing. With people from all over the world looking to make a living here, the cultural diversity in this city is second to none, and it is evident from the vibrant street food scene. Street vendors are on almost every street corner, selling everything from classics such as hotdogs and pretzels to banh mi and lobster rolls. So even if you can’t get a table at a hip restaurant, don’t fret as you can just get the same great food off the streets, and at the fraction of the price! Looking for a place to go to with kids? The New York Aquarium might just do the trick. Even though this aquarium is the oldest one in the country, it is definitely worth the visit. Spanning 14 acres (5.7 hectares) on the beachfront, this aquarium is home to 266 aquatic species like piranhas, penguins, sea lions, seals, and sea otters. Visitors can have a chance to get up close with some of the animals during the stipulated feeding times. Fun! The coolest thing about it is probably the fact that it is run by the Wildlife Conservation Society, which aims to save wildlife and wild places. Their efforts to raise public awareness about environmental issues facing the ocean and its ecosystem is really commendable. The word Brooklyn is no stranger to any beer-lover. After all, New York is one of the country’s largest brewing centers. With the recent boom of craft beers, many breweries are opening their doors for tours. Having been in operation since 1988, Brooklyn Brewery’s beers are now sold in 25 states and 20 different countries, a true testament to its quality. The Brooklyn Brewery Tour is an activity that both locals and travelers can enjoy, with a good behind-the-scenes look at the makings of a good pint. The tours that run from Mondays to Thursdays require online reservations, but include tastings of four beers. If you are on a budget, the tours are free on weekends, but they don’t include tastings. Beer tokens are available to sample the brews, though. Black Seed on Elizabeth Street has raised the bar for bagel shops. The two founders pride themselves in traditional methods and using artisanal ingredients. Their bagels are hand-rolled bagels and poached in honey water for a more nuanced hint of sweetness. Plus, the bagels are baked in batches in wood ovens, so as to get that perfect crisp and density. Since its opening in 1996, this bagel joint has catered to a steady crowd. The bagels at this much-loved establishment are made fresh in-house with a traditional recipe that has been passed down through generations. Their bagels are never toasted, retaining the softness inside while the outside is crisp. Although Junior’s Restaurant is a fully-fledged restaurant, this place is most well-known for its cheesecakes. While most establishments use graham crackers for their cheesecake crusts, the cheesecakes at Junior’s come with a thin sponge cake base. That’s not the only stand-out point, though. The cheesecake is delicious and rich and perfect, and barely needs any cream or fancy toppings. It’s just so good on its own. Fun fact: Junior’s is a favorite of P. Diddy’s, and he actually shot the music video for “Tonight” in front of the original restaurant. This establishment in the Upper East Side has earned the reputation of having the best New York cheesecake. Although they are also known for their selection of pies (pumpkin, chocolate pecan, cherry crumb… yum! ), their cheesecake is always a crowd-pleaser. Their cheesecake is velvety smooth, yet amazingly rich but not cloying. And slices are generously tall, covered with a golden top with a dark and crumbly graham cracker crust. This is the perfect example of a classic New York cheesecake done right. You can’t leave New York without experiencing one of America’s original art forms - jazz. Having been home to some of the best jazz legends for eight decades, Village Vanguard is still the most revered institutions for jazz, and for good reasons. Although it has hosted some of the top legends in the industry, including Miles Davis and Bill Evans, Village Vanguard is still very much relevant today as it keeps on hosting rising talents and has stayed away from commerce all these years. Not only that, the place’s authenticity and unbeatable acoustics are also draws for visitors to keep wanting to go back for more. How can you be in New York and not go to the largest metropolitan zoo in the United States? Even if you are not traveling with kids, the Bronx Zoo is a great place to go to, to escape the hubbub of Manhattan. Spanning 265 acres of land, this zoo is home to more than 4,000 animals, making it the perfect place to study and appreciate the creatures in their natural habitats. There are just too many to see here with the myriad of exhibits, including The Himalayan Highland that recreates the towering terrain of snow leopards and white-naped cranes and the freshwater environment of Sea Lion Pool where training and feeding sessions for these intelligent creatures are held. The zoo is located in Bronx Park, together with the New York Botanical Garden, so with some planning both can be visited in the same day. The zoo is open on weekdays from 10 a.m. to 5 p.m., and 10 a.m. to 5.30 p.m. on weekends. If you want a more unique and relaxing way to enjoy New York’s waterfront views, don’t hesitate to go down to the Hudson River to kayak for FREE! Run by a group of volunteers, the Downtown Boathouses are accessible from Pier 26 and Governors Island. The services are available from May to October. This fun activity is perfect, especially if you have a small young family. So if you have an hour or two to spare, come down, grab a paddle, and be prepared to see New York City in a whole new light. Many people visit New York solely for Macy’s Thanksgiving Day Parade, an annual parade presented by the department store chain Macy’s, and it is easy to see why. This popular annual attraction has been a New York City tradition since 1924, bringing about 3.5 million people to the streets of Manhattan every year. 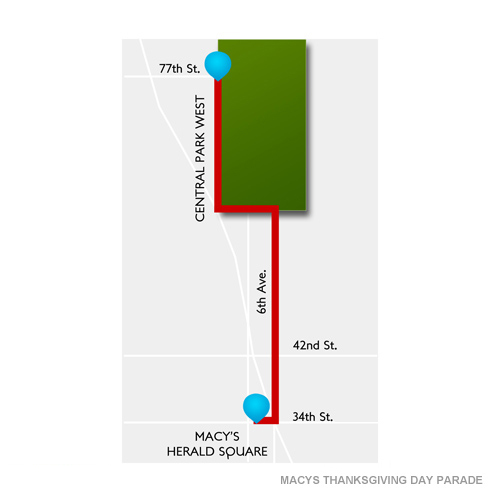 The Macy’s Thanksgiving Parade brings together 1,500 dancers and cheerleaders, 1,000 clowns, marching bands, Broadway shows and celebs, and of course, the famous floats and giant character balloons (think Pikachu, Paddington Bear, Hello Kitty, Spiderman, and Spongebob Squarepants) that are the signature of this event. Tip: Coming here for the first time might be baffling, but you won’t go wrong with camping at Columbus Circle for the best views of the parade. If you are in town for the holidays, what are you waiting for? Wake up, get some coffee, have a ball and post some selfies from the parade. Even if you’re not impressed by the city’s soaring skyscrapers and monuments, you’ll be blown away by its flourishing arts, food, fashion, and nightlife scenes. It doesn’t matter if you are rich or poor, New York has everything to offer travelers of any budget. After all, it is well-known universally as the city that never sleeps. So, why wait? Get your tickets and start planning a visit now!